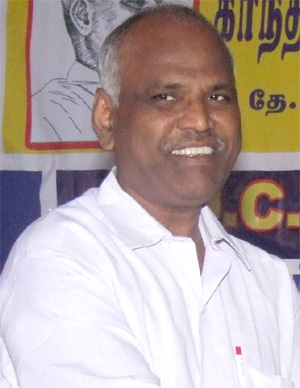 Dr J C Kumarappa’s birthday celebrations was held on 4th January. The day started with a special prayer at 6.00 am at Gandhimandapam. 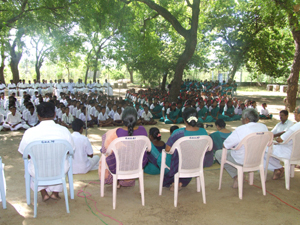 The staff of the schools and ashram along with hostel students participated in the prayer. Following the prayer Mr R Rajendran, former principal of Dr J C Kumarappa Institute of Rural Technology and Development gave a special talk on the life of Dr JC Kumarrapa. friend which immediately prompted him to go and see Mahatama Gandhi.When he went to impressed by his simplicity from that day he left his western dress and , changed himself to ordinary Indian dress and started working with Mahatama he become an exponent of Gandhian economics. His powerful writings against the British in Young India of which he was an editor for sometime when Gandhi was in jail invited the wrath of the British and he was imprisoned thrice, during freedom struggle. 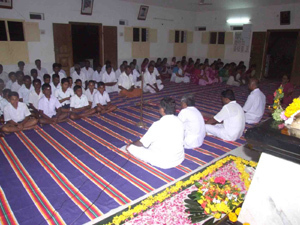 Mr R.Rajendran appealed to the ashram workers to follow the path of Dr JC Kumarappa in his simplicity, and transparency. With that the morning function was over. 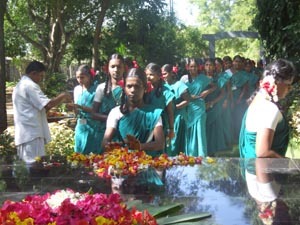 At 9.00 am the ashram community to moved to shantivan to pay floral tributes to Dr JC Kumarappa at his samadhi. 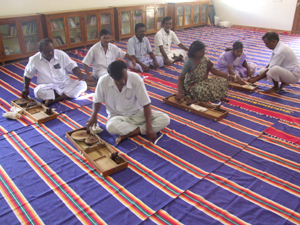 This was preceded by an inter religious bhajan by our staff. 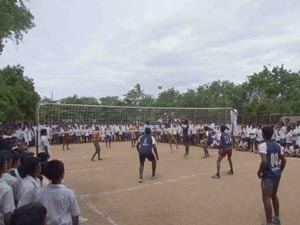 At the same time relay spinning was started by the staff of the DR JC Kumarrappa institute at Kumarappa Kutil Thereafter the community assembled at the auditorium at 10.00 am for the public celebrations. 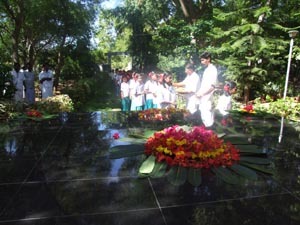 Mr Jayaprakash, another gandhian constructive worker was the guest speaker. In his address to the ashram community he stressed up the various values for which Dr Kumarrapa stood and he also narrated how the current situation which is much against the gandhian principles prevailing in the country and the ways and means to tackle them also. 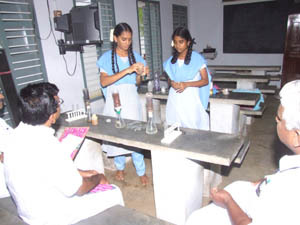 He appealed to the students to practice the principles for which Dr Kumarrappa practised. him to settle down at our ashram. 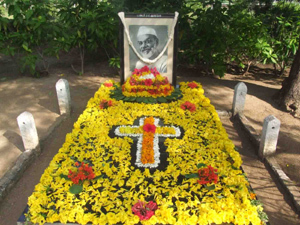 He readily accepted and his stay for 5 years was a land mark in the history of the ashram. He contributed for the growth of our institutions. 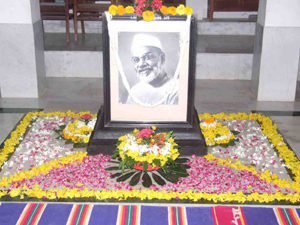 In his memory the khadi vidyalaya in our ashram was named after him during his centenary year. 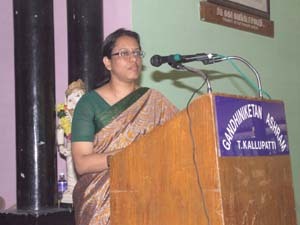 Ms P Thilakavathi, Headmistress of the school welcomed the chief guest and she stressed on the values for which Dr JC Kumarappa stood and appeal to the students to follow them. Mr Veemaraj, Principal of Dr J C Kumarappa Institute of Rural Technology and Development proposed a vote of thanks and the meeting ended with national anthem. 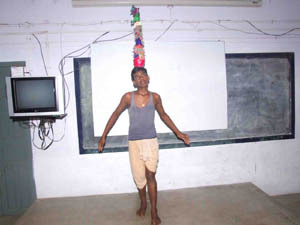 Gandhiniketan Ashram celebrated youth day on 12.01.2011. 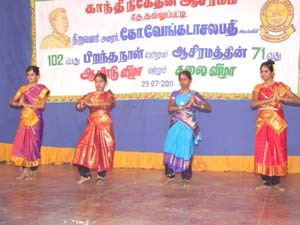 Madurai Ramakrishna Matt Swami Kamalathmananda, president was the chief guest of the day. 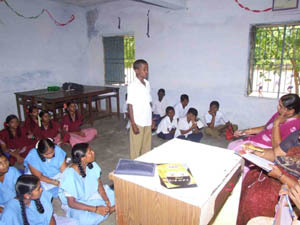 His inspiring speech, about Swami Vivekananda was greatly appreciated by the staff and students. 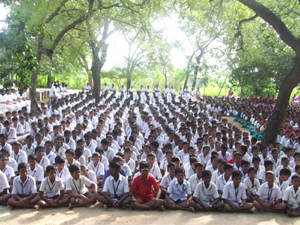 Swamiji advised the students to be patriotic and serve our country with dedication and devotion. 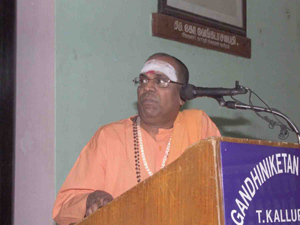 Ashram President Prof.R.Venkataswamy in his welcome address narrated incidents from Swami Vivekananda’s life, which enabled him to become a spiritual leader who was greatly admired even by the western, materialistic world. 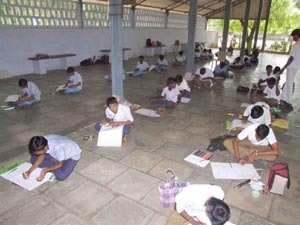 Students should emulate him and remain good citizens of our universe. Courage and confidence are very essential for anyone. 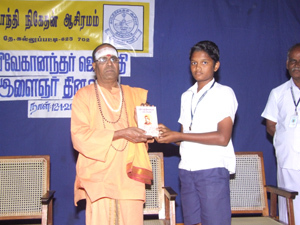 Swamiji distributed prizes to the winners of various competitions held in respect of Youth Day celebrations. 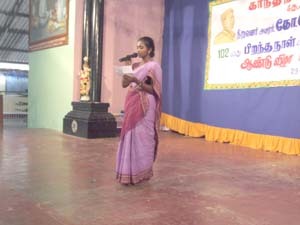 With the vote of thanks by Ms.P.Thilagavathi, HM, the celebrations came to an end. 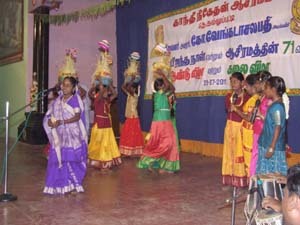 Pongal festival was celebrated at our school on 16.01.2011. 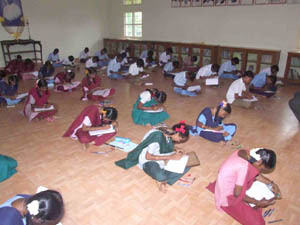 The students cleaned and decorated the class rooms and girls drew rangoli in front of every class roo. They prayed the sun god to give hope, happiness and joy to the farming community. Second day we celebrated Mattu Pongal in our school dairy unit. The students cleaned and white washed the dairy unit. 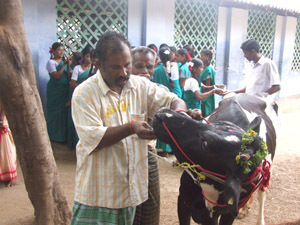 The horns of cows were painted they were decorated them with flowers and sandal paste and kumkum. 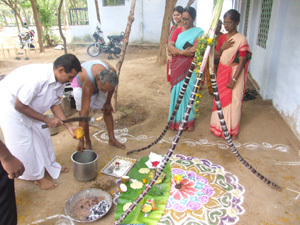 In the morning pongal was prepared and offered to God. 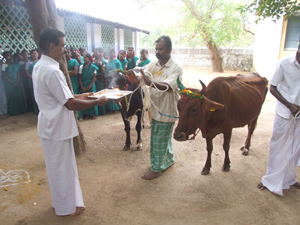 Pongal and sugarcane was given to the cows. 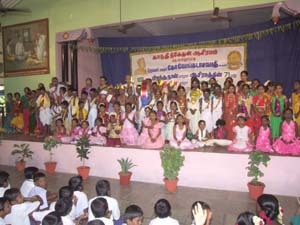 Students distributed the pongal. 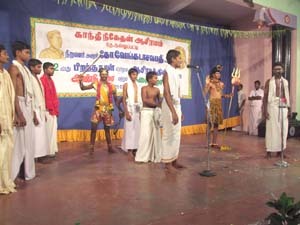 Our Headmistress staff members and students participated in this festival. 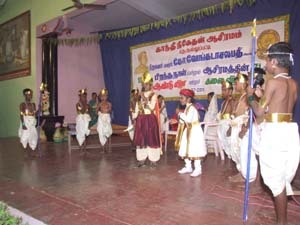 62nd Republic Day celebrated. 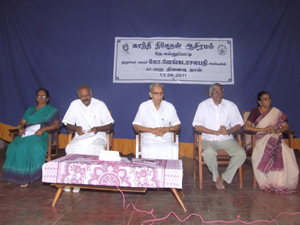 Prof.Palanithurai,Gandhigram Rural University was the Chief guest. He hoisted the National Flag and reminded as about the glory of our country and the duties of a good citizen. A special meeting, in the auditorium began at 10.00 am. 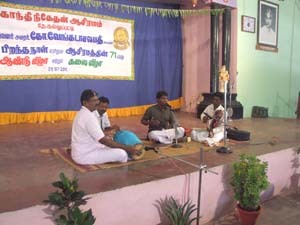 Ashram Secretary Thiru.R.Nagarajan, welcomed the gathering. 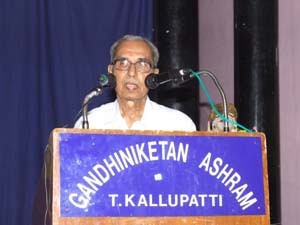 President Prof.R.Venkataswamy, in his Presidential address recollected how the Republic was formed after independence. 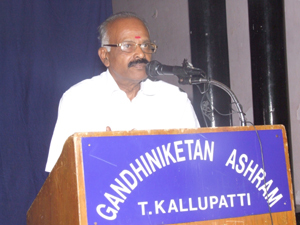 Prof.V.Ragupathy, Gandhigram Rural University also spoke about the importance of the day. 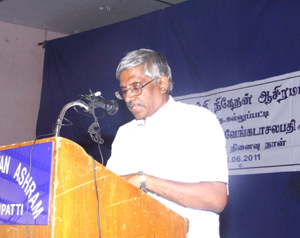 Chief guest, Prof.Palanithurai in his special address explained the characteristics of a good republic and how India remains the greatest Republic in spite of its diversities. 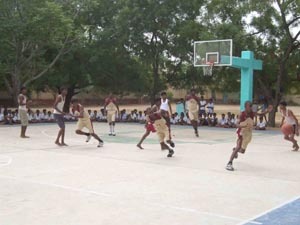 Prizes were distributed to the students who participated in the state level sports. 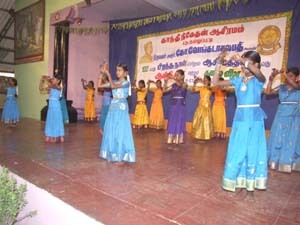 Primary school students staged cultural programmes which included, speech, song, drama and dance. 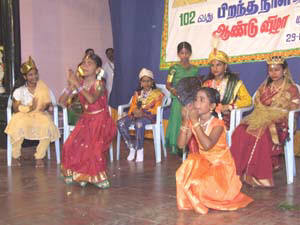 Six groups of teachers and students celebrated Republic day in collaboration with village public and local schools in six different villages around Kallupatti. 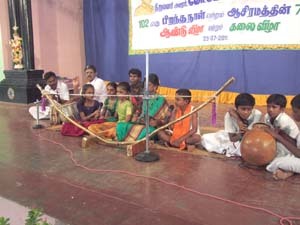 With the vote of thanks by Ms.P.Thilagavathi, HM the celebrations which began at 9.00 am came to an end by 11.45 am. 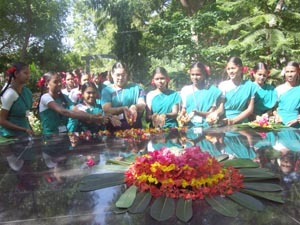 To commomerate the occasion a bajan was conducted in Santhivan which was followed by floral tributes at Founder’s Samathi. 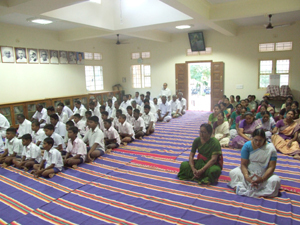 The memorial meeting was conducted in the school auditorium. 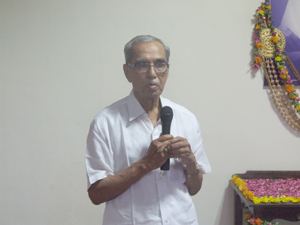 Prof.V.Ragupathy one of the directors of our Ashram in his welcome address recollected the services of our Founder. 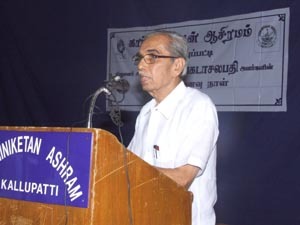 Prof.R Venkataswamy, Ashram President in his inaugural address narrated the virtues of our Founder which placed him amidst the great personalities of his time. 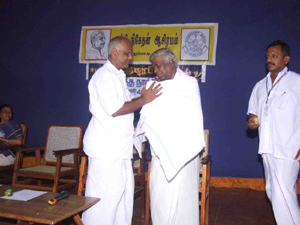 Thiru.V.Vivekanandan, President Gandhi Seva Centre, Sengottai was the Chief guest and in his special address vividly described the simplicity of Dr.J.C Kumarappa, a great Economist, who was a close associate of our founder and a well wisher of our Ashram. He also pointed out the flaws in our educational system. He explained the strength of people which could bring about a great change in our rotten society. Dr.Subramanian and Thiru.Murugesan from Madurai Apollo Hospital, Our Administrative Officer Ms.V.Radha, Former HM Ms.R.Rajeswari along with VIPs from T.Kallupatti graced the occasion. 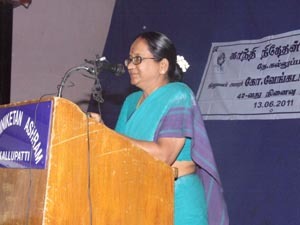 Ms.P.Thilagavathi HM proposed vote of thanks. President Ayya in his welcome address expressed his desire to make our students excel not only in studies but also in traditional arts. 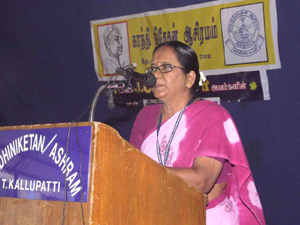 Dr.Rohini Sridhar Director Madurai Appollo Hospitals presided over the function, She appealed to the students to inculcate and nurture good qualities which will automatically push them up in life. She also enumerated the various service –oriented medical activities carried out by the Appollo Hospitals throughout the nation. She described the future plan of action to conduct medical survey and camp along with Gandhiniketan Ashram in near by 7 villages. The programme is scheduled to start on 15th August. 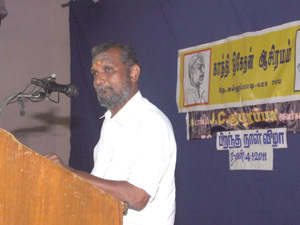 Thiru.Ponnuchamy, Retired Deputy secretary to govt in the Department of Tourism and culture. 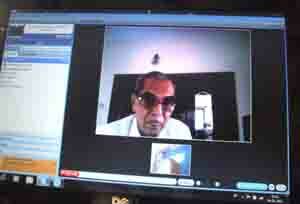 He vividly explained the various types of tours in India. 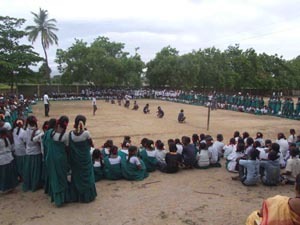 Higher Secondary students gave their performance in the after noon. 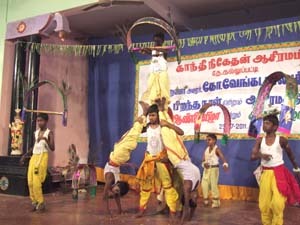 Bharat Natyam, kavadi, Silambham, Villupattu. 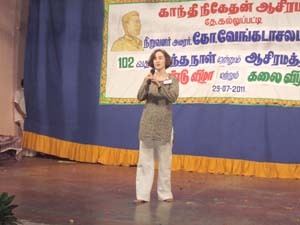 Karagam, Tamil and English dramas, comedy show and solo songs were captivating, We had a solo by a school student from UK.